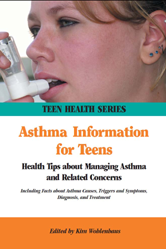 Comprehensive information about various forms of asthma, factors that may contribute to the development of asthma, and common asthma triggers. Chapter 13—What Does A Pulmonologist Do? Chapter 14—Should I See An Allergist? Chapter 16—What Is A Peak Flow Meter? Chapter 19—How Is Asthma Treated? Chapter 28—Do Inhaled Steroids Stunt Your Growth? Chapter 32—Allergies And Asthma: What's The Connection?